Pollution control, a key component of U.S. environmental policy, has made important progress in recent decades. Yet important problems remain and there is need for improvement in the pollution control regulatory system. 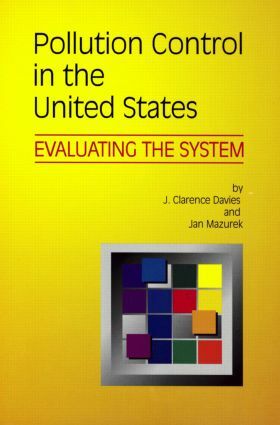 This book is the most extensive evaluation of that system ever produced. It reveals many strengths and accomplishments, but also illustrates serious shortcomings and the need for reform. The volume emerges from three years of research on a fragmented 'system' of institutions, statutes, and procedures that is often inefficient and ineffective, hobbled by misplaced priorities. Part I provides an in-depth description of this system, centered on the federal Environmental Protection Agency and the labyrinthine laws it must implement. The authors evaluate the federal legislation, administrative decisionmaking, and the state-federal division of labor that defines the system. Davies and Mazurek assess the effectiveness and efficiency of U.S. pollution control. They discuss the performance of U.S. laws and regulations in comparison with those of other nations, assess the ability of the U.S. pollution control system to meet future problems, and consider proposals for reform and repair. Within this far reaching analysis, they include criteria that are often overlooked by policymakers and analysts, including social values, equity, nonintrusiveness, and public participation.